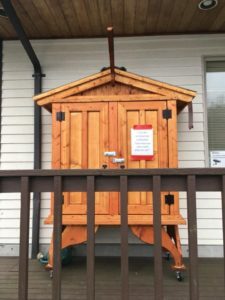 Fishline now has an “Afterhours Cupboard” outside the food bank where clients can pick up needed items when the food bank is closed. Fishline supporters can also drop off non-perishable items here when we are not here to receive your donations! This beautiful pantry was made by one of our Fishline volunteers and is just another way to serve our clients. The pantry is located outside the food bank at 787 NW Liberty Lane. All are welcome to use and donate to the cupboard. Visit our Facebook page to learn find our weekly list of most needed items or to ask any questions about this resource. When these volunteers started our weekly outdoor Free Closet, you could practically predict the weather based on whether or not it was Wednesday. If it was below zero, it was Wednesday. If the wind was blowing sideways, it was Wednesday. Six months later, they have good reason to don their Hawaiian shirts! Why start an outdoor anything in the dead of winter? Well, in this case, longtime Fishline volunteers Helen Supancheck and Karen Calhoun heard a story. It was about a boy who came into Fishline without a coat. While we often give vouchers for folks to buy clothes at Second Season (our thrift store), no clothing was available on site. This was enough to spur these women into action. They enlisted their husbands, Greg and Steve, their neighbor Kaori, and even her spouse! This operation is no easy feat: inventory is picked up almost daily from Second Season. They load and unload hundreds of pounds of clothing, haul it upstairs, and sort it in whatever available space they can find. But the service has been so well-received, they have no plans to quit anytime soon. Helen told me that they knew they had done the right thing when one day, early on, a homeless man without shoes came by. They had exactly one pair of shoes in their entire inventory and guess what? They fit him like a glove! 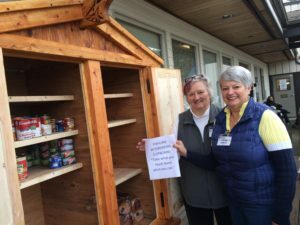 North Kitsap Fishline received a $300,000 grant from the Birkenfeld Foundation to support construction of its new Food Bank and Comprehensive Services Center in Poulsbo, Washington. Construction of the project is underway with expected completion in early summer of 2018. The new building will provide both efficient food delivery and integrated comprehensive services to help clients achieve self-sufficiency and transform their lives. The Comprehensive Services Center will create the first coordinated effort in North Kitsap to bring together providers partnering with Fishline to offer services related to food, employment, education, substance abuse, dental care, domestic violence, housing, senior, and veteran’s services. Keith Birkenfeld, who died in 2005, was a Bremerton native who retired from the Bellevue School District, where he taught in the high school and served as an administrator. He spent his last 25 years living on Bainbridge Island and amassed a fortune through sound investing that he directed to support of impactful charities upon his death in 2005. Click here for more information on how you can support Fishline through the Birkenfeld Gardens. The spirit of the season is year-round for some local businesses and their employees. Take Poulsbo’s Wells Fargo team, for example. Each week one person from their branch joins our Wednesday morning crew, helping to stock our market’s shelves, receive donations, and pitch in where needed. Les Schwab owner Brett Clark not only gives his time as leader of Rotary’s Interact Club, but encourages volunteerism among his employees. In fact, at Les Schwab, fulfillment of community service plays a role in their promotion process. 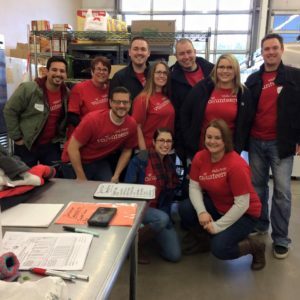 Other employers, like United Health Care, not only compensate employee volunteer time, but they’ll match that contribution in dollars. Workplace volunteerism is traditionally viewed as an employee benefit, but it’s a benefit to the whole community! More than 8 in 10 companies believe that volunteerism can help nonprofits accomplish long-term social goals (from a recent Deloitte survey). 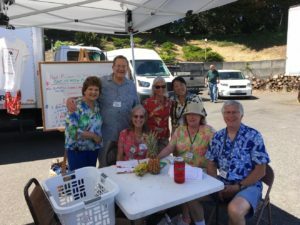 It’s a win-win and we’re fortunate to have these forward-thinking businesses right here in Kitsap to show use that you don’t have to be retired to volunteer! Why not ask your employer whether they offer workplace volunteerism as a benefit? If they don’t, maybe it’s time to start! If they do, we’d love to have you join us here at Fishline.